I felt I should take full advantage of my flexible work to get to know new places and keep flying during the months when the flying days here in PNW become few. My idea was to go somewhere in South America for roughly two months. At work I proposed working remotely part time during this time and it got approved. I departed last day in November 2012 on a one-way ticket to Lima, Peru with a plan to start in Iquique, Chile, then meet with my girlfriend in Venezuela during the holidays for non-flying travelling and finish with more flying in Colombia. The first time I heard about this place was through the USHPA magazine where I saw pictures of pilots flying over sand dunes and immediately put it on my list of places to visit. 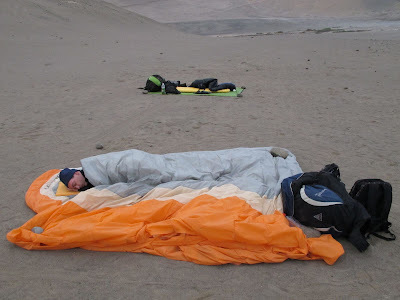 Most flying tours to Iquique take place during the month of Nov but after reading posts on http://www.paraglidingforums.com it sounded like a place where one should be able to fly a lot most of the year including Dec. The best flying conditions when long XC flights along the coast are possible is from late October to the end of Nov. Conditions usually deteriorate mid-Dec as they did when I was there but that effects mostly the ease and possibility of long distance flights. 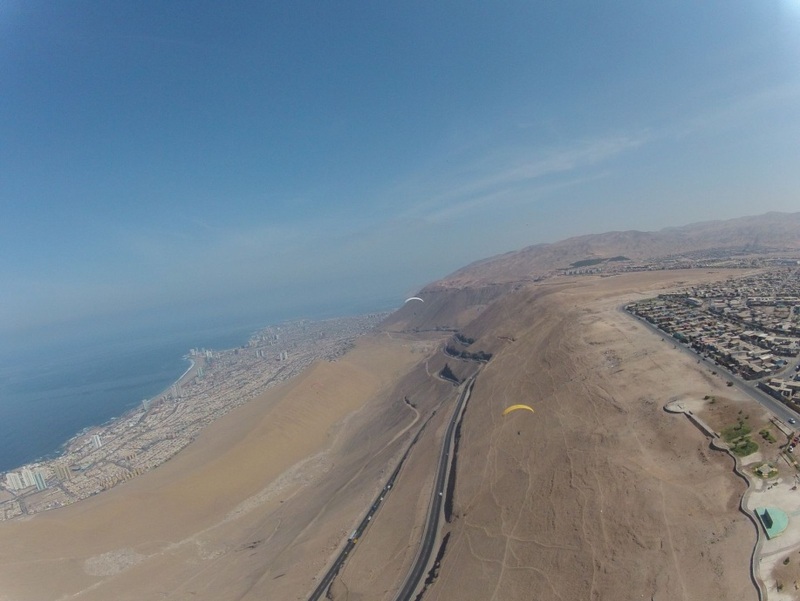 People come to Iquique year round and can truly fly a lot in terms of air-time and number of flights. 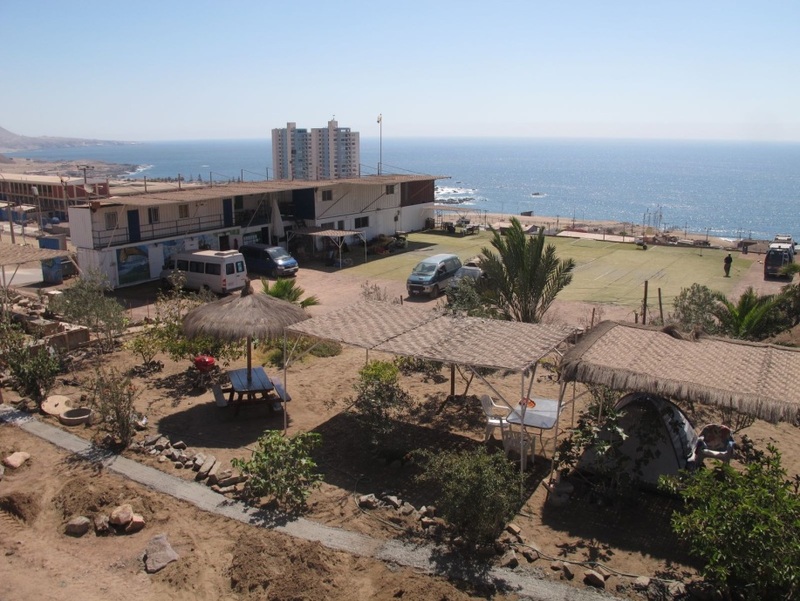 Places to stay: Iquique is a port city in northern Chile and the capital of both the Iquique Province and Tarapacá Region. It lies on the Pacific coast, west of the Atacama Desert. Atacama is one of the driest places on the Earth and the climate in Iquique reflects it. There is pretty much nothing but sand around the city and the launching and landing is always on sand so one recommendation is to bring either old wing or good kiting skills. Despite the dryness and everyday sunshine the temperatures are quite moderate and it gets pretty cold at the cloud base. 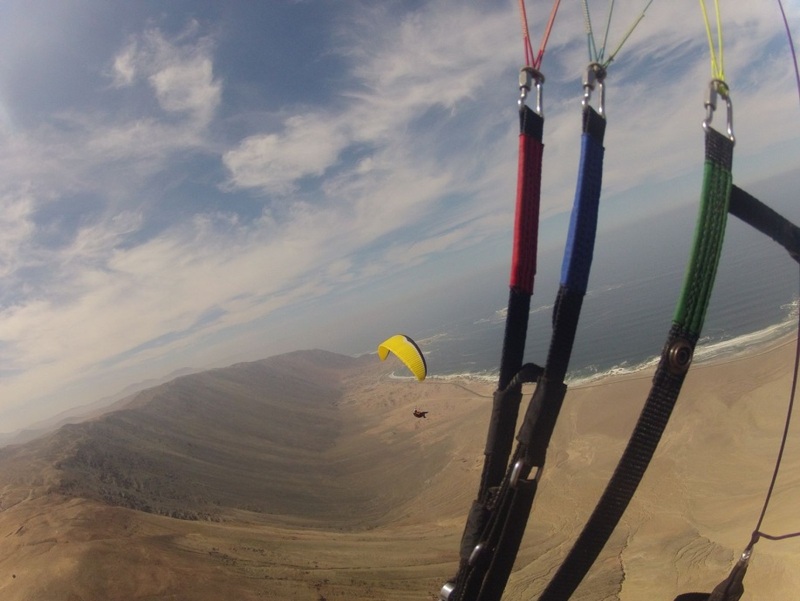 Paragliding: Iquique has an airport about 25 miles south of the town which you can fly to if time to travel is limited. The airport also imposes some air space restriction. It is not allowed to fly above 1000m (3300ft) and pass the airport except on weekends after obtaining special permission at the airport. Flying the other way is not restricted but there are no roads north of the town along the coast and landing options are limited. All sites I have been to are right on the coast facing the Pacific Ocean and work with any westerly wind which comes reliably every day. The wind becomes very strong mid-day. Typically people fly in the morning launching between 9- 10am and in the afternoon after 4pm until sunset. Most sites are suitable for beginners early in the morning and late afternoon. This place is a playground for acro pilots and fun for XC pilots. All sites are a mix of ridge and thermal soaring. Thermals are marked by vultures and became very small and nasty later in Dec when the air was harder to read. During my stay the cloud base was usually at or below the air space ceiling. Places to stay: There are many inexpensive hostels in the town but most pilots stay at the Altazor flight park. The park is built from old shipping containers but it is a lot better than it might sound. A private room with bathroom is roughly $20. It has camping area for budget travelers, common kitchen, WI-FI and a very convenient large carpeted area for getting sand out of your wing. The flight park is very popular with pilots from Europe and English is spoken here. Regarding transportation to the flying sites the park has a small fleet of 4x4 vans available for rent. 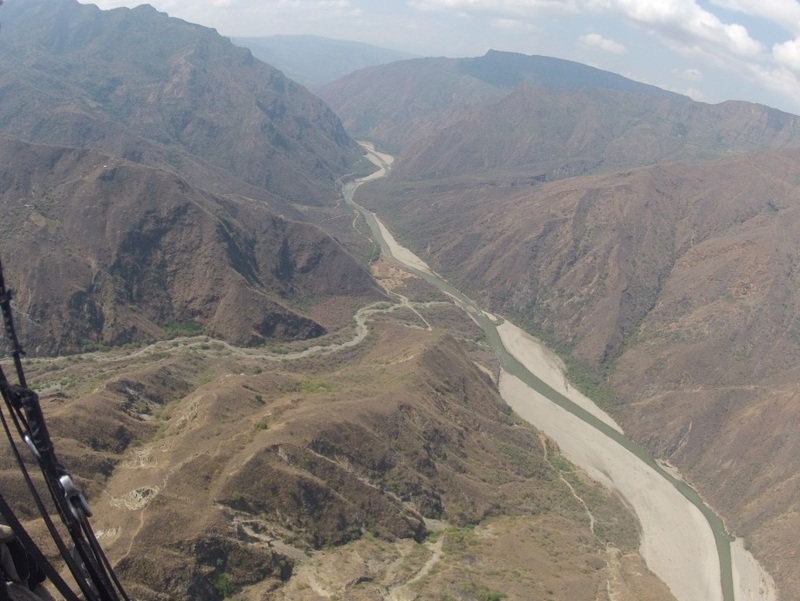 Trips to more remote sites like Pisagua are organized by the park or other pilots. 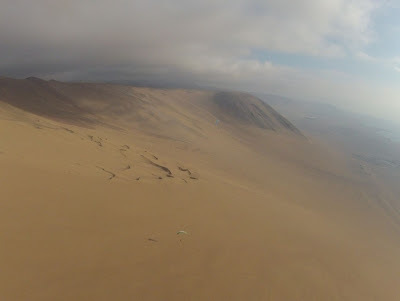 Alto Hospicio: This is the closest site which is located above Iquique right behind the flight park and is reachable by public transportation. From the park it takes about 30 minutes by bus. It is possible to land on the dunes behind the flight park but typically people fly north along the top, cross the town and land on one of the beaches. When it was time to do grocery shopping I would land on Playa Brava, walk to the supermarket and take a bus back. Palo Buque: This is the usual afternoon site and is located about 10 miles S from the park. The launch is the same as the LZ. To take off one has to kite the wing up a small dune. After voluntary or involuntary take off one would ridge-soar along dune until enough altitude is gained to make a transition to the main slope. The launch requires strong wind anywhere between S and W. In the 3 weeks I spent in Iquique it didn’t work only twice. The day might start with NW wind but it typically shift to SW by mid-day. San Marcos: This site is located about 100km south of Iquique and the main reason to go there is to attempt long distance flight back north. The park usually doesn’t organize trips there but I was lucky a German tour group was looking to fill a spot in the van they rented. The road there eventually leaves the coast and goes deeper into the desert on roads used by salt mining companies. Some sections are lined with white salt which resembles driving in snow. As it was said before Dec is not the best for XC flying. We all struggled to stay up. After about 1 hour I tried pushing north following the leader of the group but sunk out behind the first corner. 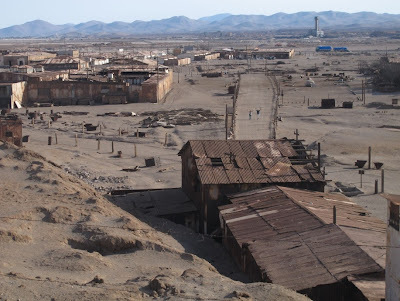 Pisagua: The town of Pisagua is located about 2 hours driving north of Iquique and used to be important port in Chile during the nitrate mining boom but it has been on a rapid decline since 50s when the boom ended and the town lost most of it inhabitants. A flying trip to Pisagua is often organized at the park and is done usually as overnight trip with camping on a beach. There are two flying sites – the morning site south of the town and the afternoon site north of the town near the camping spot. We flew the morning site twice but it didn’t work well. Launch is accessible by 4x4 and is at the top of the cliffs above the ocean. Landing options below are plentiful but can be very thermic. Top landing is preferred. If you land at the bottom it takes anything between 30 minutes to 1 hour of hiking back to the main road. With luck you might get a ride in a pickup from people harvesting seaweed. I got such ride which is on bad dirt road along steep cliffs with sharp turns. It was scary. The afternoon site is at the N side of an entrance into a narrow canyon with a dry river bed at the bottom. Flying deeper into the canyon is not a good idea and people usually stay at by the entrance. You can finish the afternoon flying session by ridge soaring smaller sand bank directly above the camping spot. To get to Caracas to meet with my girlfriend for the next stage of my trip I decided to go by plane from Iquique. We had great two weeks of adventuring in Venezuela but that is another story. 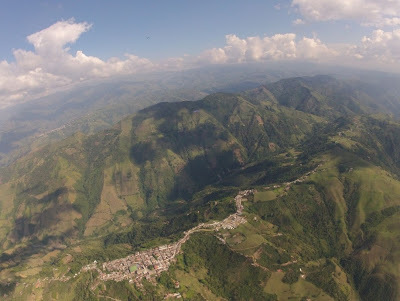 I thought about paragliding there but when talking to local pilots from Venezuela I was told it is not safe for an independent pilot, plus we ran out of cash Dollars which are essential for traveling there. So the same day my girlfriend flew back to Seattle I boarded another plane headed for Colombia. While in Iquique I met Richi the owner of Colombia Paragliding which a flying school and hostel located in Bucaramanga right next to a flying site called Las Aguilas. 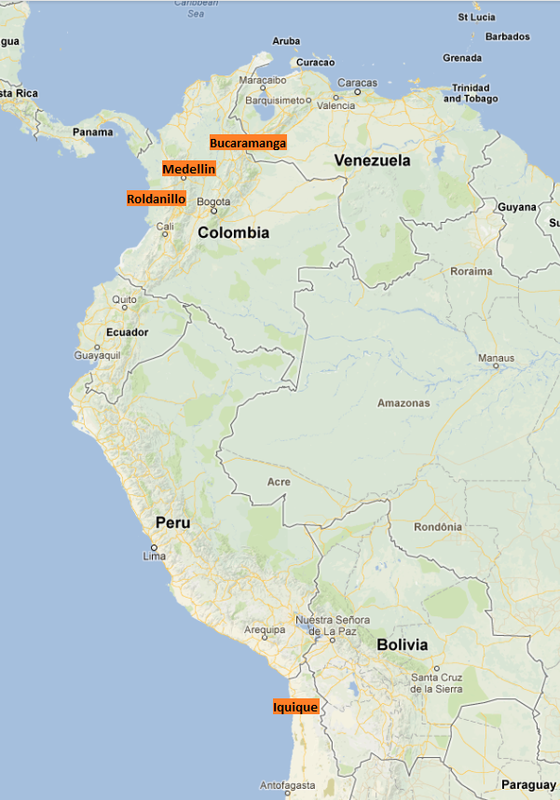 I decided to make it my first stop in Colombia. It is also a place with very reliable every day conditions and I really liked when he mentioned the grassy launch. Spending 3 weeks surrounded by sand made me miss vegetation and Colombia has plenty of it. Bucaramanga is the capital city of the Santander state and located in the NE of Colombia at the west side of the mountains on the border between Colombia and Venezuela. The climate is more humid and also a lot hotter so flying in shorts is fine. Places to stay: Staying in the flying hostel is the most convenient because of the short walk distance to the launch. The hostel is nice with a dorm and private rooms. The room fee covers breakfast prepared by the lovely caretaker lady, flying site fee, grocery runs to the town once every 3 days and retrieves from the main LZ. The hostel seems popular with pilot from USA so English is spoken here. Most local pilots also speak good English. One downside it a disco located next door. Laud music is part of South American culture so do not count on getting much sleep on Fridays and Saturdays. Other days are fine. Some people deal with this nuisance by getting a room in other hostels in the town during the weekends or joining the party. Paragliding: In general this place does not have a good long distance flying potential. Both sites I flew here are usually thermic in the morning. But around noon the wind starts building up and become very strong mid-day. Solo pilots usually try to launch around 10am in the morning and around 4pm in the afternoon. Las Aguilas: This site is located next door to the flying hostel. It is not very high and the main LZ is a long glide away in a field shared with radio-controlled aero models. You should expect sink on the way there. So pilots need to start heading to the LZ as soon as they find themselves below the launch level. This makes it tricky to get a long flight especially in the mornings when there is only thermic lift. Pilots gather around 10am on the launch and watch the sky for large flocks of vultures marking a thermal. If you don’t catch one as soon as possible the flight will become a 5 minutes affair. My success rate of catching the first thermal was about 50%. When you do catch one they are large and smooth and go to over 5000ft. If you feel you are not going to make the main LZ there is a small bailout LZ with trees closer to the launch. 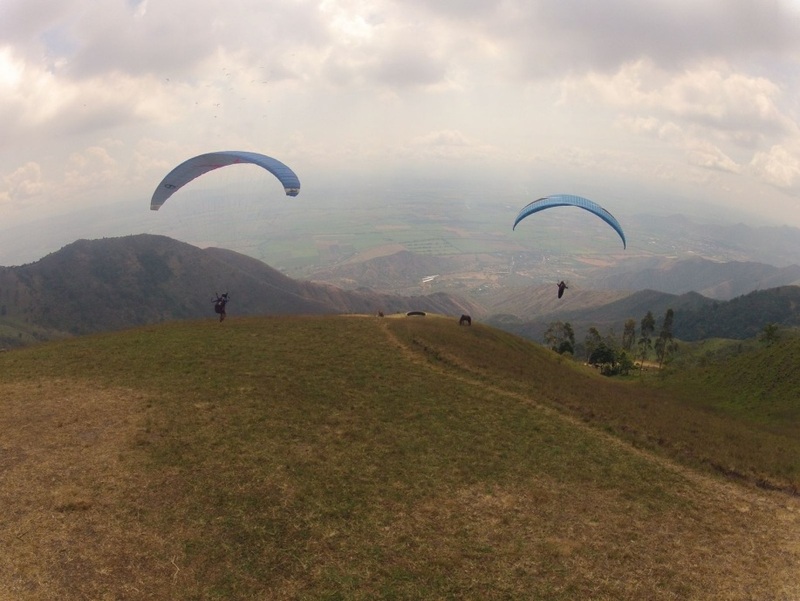 The locals prefer to top-land which becomes challenging in the afternoon because the strong wind generates a lot of lift and the site is very busy with tandem flights. All tandem pilots top-land. The site is suitable for beginners but trying to top-land is probably not. Chicamocha Canyon: This site is located south about 1.5 hours of driving from Bucaramanga in the Chicamocha National Park. Trips to this site are organized at the hostel every once in a while. The launch is located on the east side of the large canyon at elevation roughly 5100ft and landing is at the bottom on a river bank 3500ft lower. The danger here is again strong wind in the canyon by mid-day so flights are done early. We had a few beginners in the group and launched perhaps too early to have a soaring flight. Still it was a very scenic. The bottom is a hot place. Luckily there is a river you can jump in to cool down. Bucaramaga was fun but a week felt like enough time spent there. 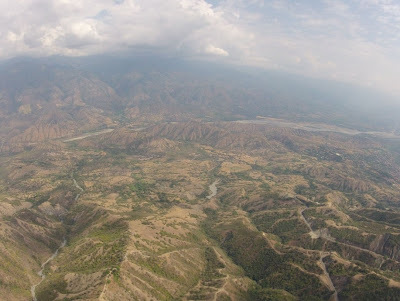 During my stay here I learned more about other sites in Colombia and made a plan to head first to Medellin and then Roldanillo as my final stop. On 1/17 I got off a direct overnight bus in Medellin - the second largest city in Colombia and the capital of the Federal State of Antioquia. Before coming here I got a contact for Florian, a Swiss pilot currently living in Medellin and running Paraworld. I made a reservation via email in a hostel he works with - Hostel Poblado Park (note to future travelers the web site makes it sound like there is a Paraworld Hostel). I knew very little about flying in Medellin except there is a site reachable by public transportation. As in previous locations I was expecting to run into bunch of pilots who would show me around. To my disappointment I was the only pilot around. Later I learned why. 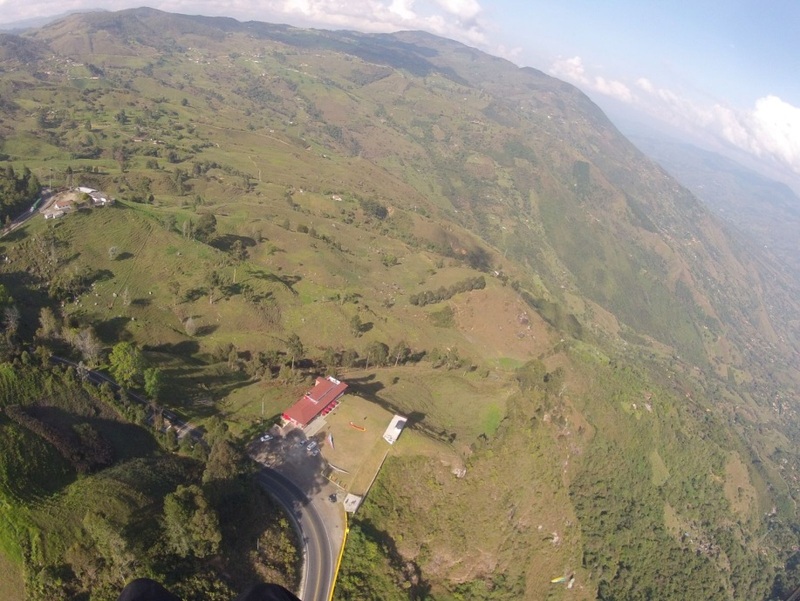 Medellin is not a great location for independent pilots. Even to the closest site called San Felix it takes 1.5 to 2 hours by public transportation. While it is a site worth flying the logistics are too complicated. Luckily for me a group of Swiss pilots was coming for a tour on the 18th and they allowed me to join the group. Their plan was to explore various sites and during the 9 days I spent with them we flew 9 different sites. 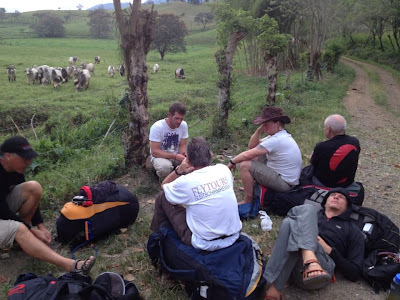 Medellin was our base the first 5 days and then we moved a bit further south to La Pintada. Some of these sites were the most scenic I flown during the whole trip. Unfortunately for independent pilots it would be almost impossible to fly most of these sites without the local knowledge about how to get there, where to land, whether you need permission from a land owner and where the house thermals are. Paragliding: All sites were in the mountains, thermic and with great XC potential. Some launch sites were developed, some were wild and hard to find; some were on private land requiring permission from the owner. Just like takeoffs some landing spots were on private land and prior permission had to be obtained. Most of the sites we flown would not be suitable for inexperienced pilots mostly because of the landing which was many times in limited space or not reachable by glide only. In this part of the Andes the mid-day wind was not an issue and we usually took off when it started looking good (or Florian said it looks good). There were not as many vultures to mark lift so the best was to known where the house thermals are. In these parts it quite often rains during the night. We had a couple of days when the rain would not stop until the afternoon. Waiting for the clouds to break up was filled with sight-seeing. 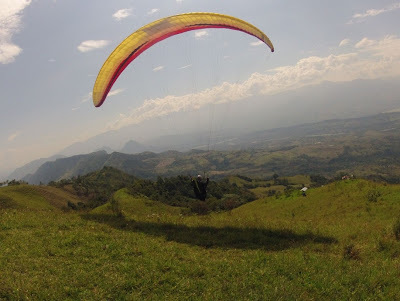 Cocorna (1/21): Public launch with fee, launch is small and very steep, site very scenic with a waterfall, good XC, main LZ in a soccer field with limited space and high fence – intimidating. 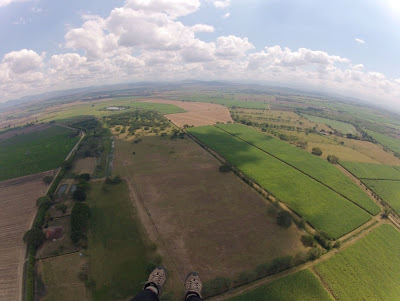 Jericho (1/25): Public launch on a cliff, very scenic and good XC, landing in a private field with bunch of cows which run away from the approaching glider which means they run to where you intend to land on your final. We had cloudy conditions and it was only a sled ride. LZ was fairly far. The last pilot had too much sink due to the wind switching direction and didn’t make the LZ. It took him 4 hours to hike out to the road through fields and dirt roads. Cordoncillo (1/26): Wild launch on private land. The plan was to fly XC to La Pintada. Out of the few pilots who decided to fly I was the only one who didn’t make it and had to use a bailout LZ landing on a grassy slope. 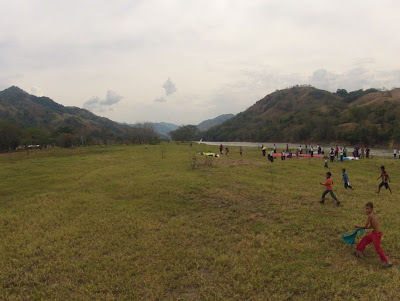 La Merced (1/27): My last day with the group, developed public launch, easy top-landing, very scenic, good XC, main LZ with power lines, thermic and on a side hill. I got attacked by tiny biting ants while packing. 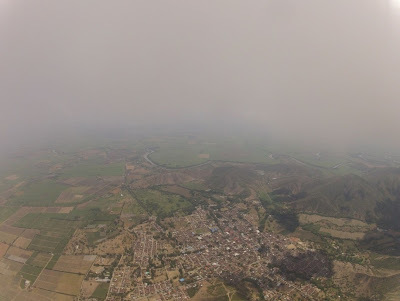 Roldanillo is a place of long distance flying and the location of the PWC Superfinal (http://superfinal.airnomads.co/). This year the competition was from 1/15 to 1/26. Officially free flyers are not allowed to fly during the competition so I stayed with the Paraworld tour until the end of the competition. Unofficially it is ok to fly. Getting there: Getting there is easy by a bus. You can fly or take a bus to Pereira. From there smaller buses leave to Roldanillo every hour. http://www.deoccidente.com/ seems to be the biggest company servicing the towns in Cauca Valley. Accommodation: The main point of contact for Roldanillo is http://www.cloudbasecolombia.com/ which has also been started by a Swiss pilot and does tours, tandem flights and provides accommodation to pilots. The Cloudbase hostel gets busy but there are many other options right in Roldanillo of in other towns like La Union only a short bus ride away. I ended up staying in a small hostel run by two local pilots which I found through another Czech pilot I met in Bucaramanga. 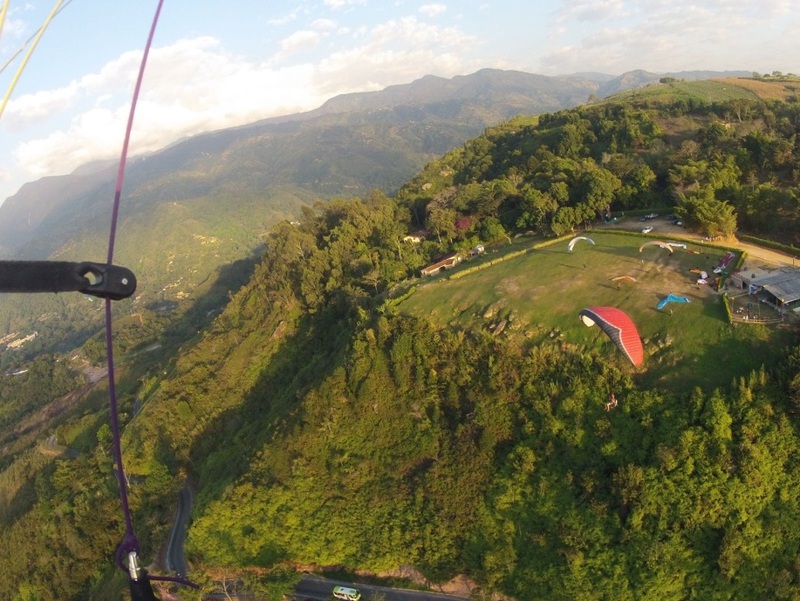 Paragliding: Takeoffs are on the W side of the valley. On a typical day strong wind starts blowing from the W over the mountains around noon making this only one-flight-a-day place. Because of the threat of the wind it is recommended to launch early around 10am. Even without good cycles at the launch thermals seem to work well even on cloudy days. People usually fly next to the mountains staying at the cloud base until there are indicators the valley is working. Flying along the mountains can be quite turbulent. You need to be away when the W wind comes. I was told to start heading over into the valley between noon and 1pm. The valley is oriented north-to-south with a major road on each side (W and E). There is a big Cauca River in the middle and a few roads going across the valley. These roads define the routes people fly in the valley. The location is fine for beginners. There are some high power lines to cross which is more of an issue when launching from Pico which is deeper in the mountains. Landing: People seem used to pilots landing on their fields so you can land anywhere as long as it is close to a road. It could be a very long walk. After getting to a road you just need to wave one of the busses which go by frequently. When I landed closer to the town and was walking back locals would stop to offer me a ride. 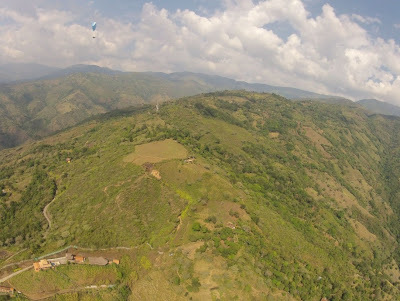 Paragliding in Roldanillo brings good business to the area so maybe that’s why the people are nice to pilots. Transportation: All you need to do is to be at the square in Roldanillo around 8:30 and you get a ride by a Jeep. A few times when walking to the square I got on a Jeep at CloudbaseColombia hostel when they had a spot. They can pile up to 12 pilots on one vehicle and it goes to the launch the majority of the assembled group wants. Los Tankes: a.k.a the comp launch is halfway between Roldanillo and La Union. Quite big and gets busy but it was not a problem. From Roldanillo it takes about 45 minutes, cost about 7000-10000COP and there is a 2000COP launch fee. El Pico: is about 30 minutes from Roldanillo. Less crowded but lower, smaller and steeper. Aqua Panela: Is just behind El Pico and is accessible by public transportation with a short walk. We used it once when El Pico was busy with hang-gliding competition. Food: Good selection of restaurants and bakeries. Lunch special was about 6000 COP and dinner with beer in a nicer restaurant about 15000 COP. For doing your own catering there are two supermarkets in the town. Other activities: There is the odd Museo Rayo http://www.museorayo.co/ in Roldanillo other than that not much else. So bring some entertainment for those rainy days or when your flight is too short. It is possible to rent a bike or a motorcycle to explore the hills. Feel free to contact me for more information at jiri_richter@hotmail.com. You can view all sites flown during this trip including flight tracks on Google Earth. The sun on your face; the wind in your hair; breathing in the dusty and smokey air, while riding in the back of a pickup truck. This is, The Guatemala Experience. It's the way people get around there; sometimes 10 strong precariously seated in the bed of a small pickup. It's also how we got around, if we so chose. 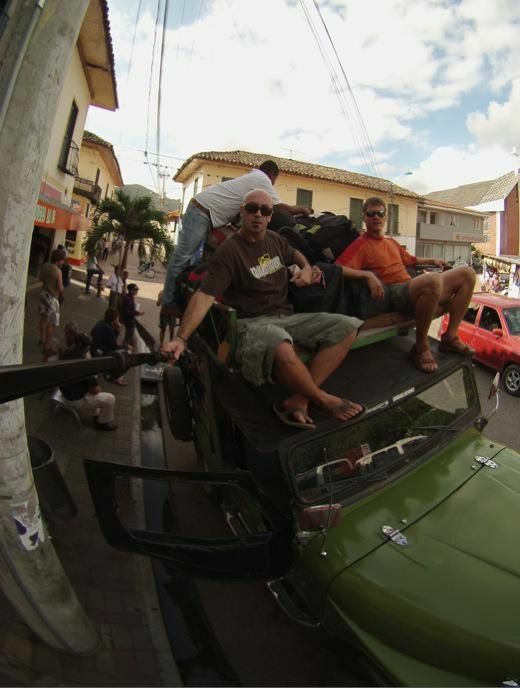 The option was always there to ride inside a vehicle; but a few of us usually opted for the back of that pickup truck. It just enhanced the experience of taking in everything I was seeing as we drove past cane fields, through impoverished towns, and up mountainsides on dirt roads. 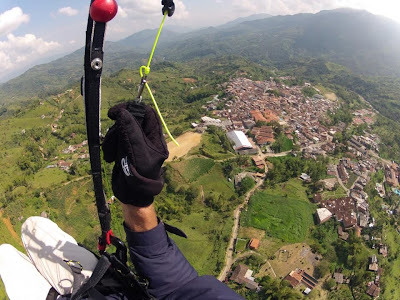 But we didn't travel 3500 miles just to ride in the back of a pickup truck; We came to paraglide! 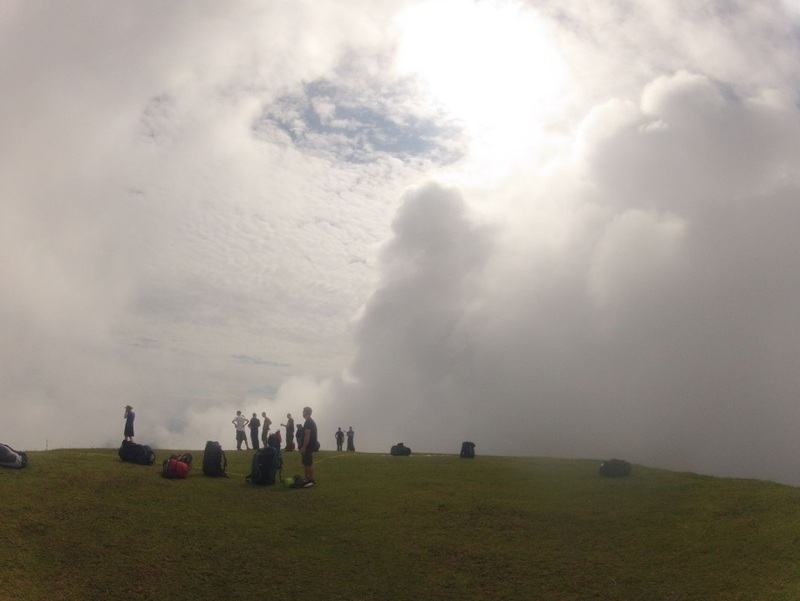 Not only did we come to paraglide, be we came to paraglide off a 13,000 ft volcano! So, first order of business was to scope out our main landing zone for said flight off Volcan de Acatenango, which was the La Reunion Golf Resort. Not many country clubs or golf resorts would open their doors and just hand over golf carts to a group of paragliders to go drive around the course, spread their wings, and kite in the middle of a fareway. But in Guatemala, where the saying goes that a bottle of scotch and $20 can get you what you need, anything is possible. 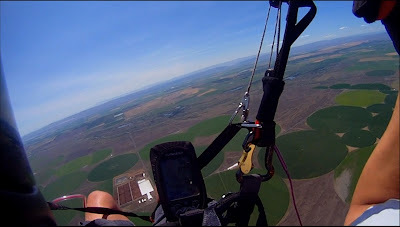 A good part of that first day was spent at the golf course; a little kiting, Andrew Kern had an unexpected short flight off the fareway, and we all enjoyed a pleasant lunch out on the patio taking in the views. The weather wasn't cooperating for afternoon flying, a poorly positioned convergence meant the north wind site and south wind site we visited were both blowing over the back. Such is the game of paragliding. Later that evening (as with all evenings), the weather forecast for the next day was reviewed. It appeared that the weather gods were going to be smiling upon us for a flight off the Volcano. The cool thing about Volcan de Acatenango, is that it is shouldered up next to the very active Volcan de Fuego. We woke bright and early the next morning, shuttled to the Golf Course, and awaited the arrival of the helicopter that was going to fly us to the top. However, it wasn't meant to be this day. Gusty winds at the golf course and the smoke signals coming off Fuego didn't paint a pretty picture for the conditions up top. It truly is amazing, to be able to stand in the landing zone and gauge conditions at launch 10,000 vertical feet away... courtesy of an active volcano simply doing it's thing. 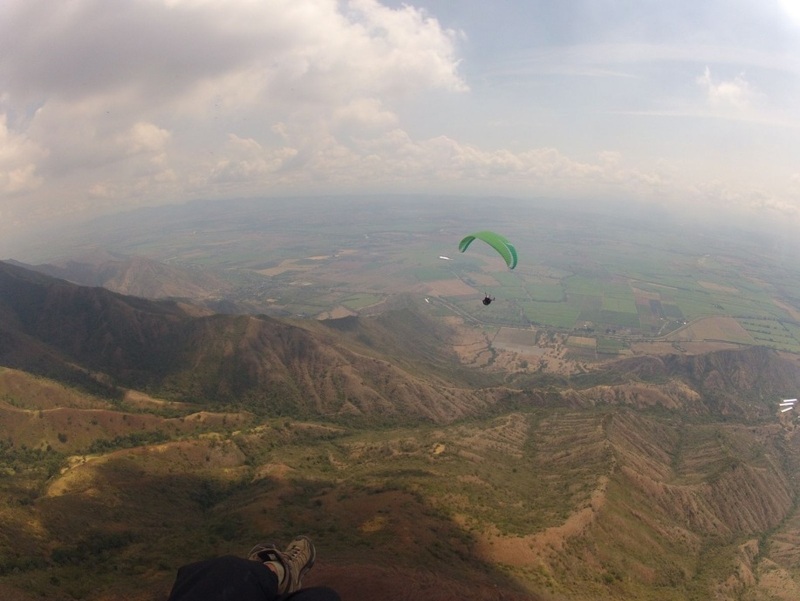 With the volcano attempt postponed, we hopped back in the vehicles and took a short 30 minute drive to another paragliding site, Santa Elena. It is situated just a bit south of Lake Amatitlan on a ridge facing away from the lake; providing both ridge soaring and thermals. It is a beautiful area; however, standing on launch surveying the lands below, it's easy to get intimidated viewing the landing zone off in the distance... a 7 to 1 glide into the wind away. It is imperative to catch a bump in order to make it to the landing zone. One glider fell a bit short, giving them an up close and personal perspective of rural Guatemala. But, redemption was had on their second flight. After a day of flying, we headed back to the Casa to relax and plan out the next day. The weather forecast again showed promise, so we repeated the same song and dance of waking up early and heading out to our staging grounds at the golf course. Conditions at the golf course were already many times better than the prior day. Clouds were building up around Acatenango and Fuego causing a bit of caution, but viewing them relative to Volcan de Agua across the valley kept us optimistic. 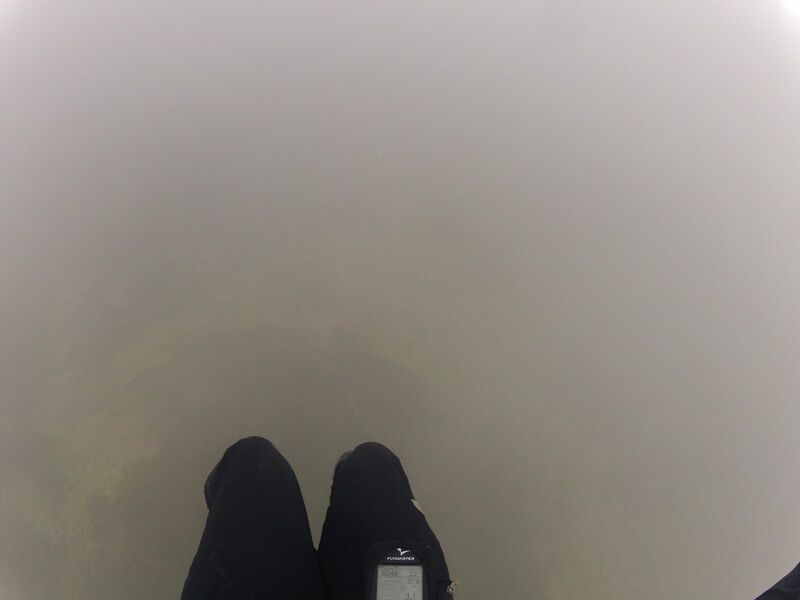 Our helicopter ride to the top was delayed due to a fog layer at the airport, putting a hold on air traffic. But that fog layer gave more confidence in the forecast holding true. After anxiously awaiting, word came that the helicopter was in the air and on the way to the golf course. The anticipation of waiting for the helicopter to arrive was agonizing though. An idle mind is the Devil's playground, and every passing minute gave more time to wonder to myself, "wow, am I really in this situation? Am I really about to do this?!" People think I'm crazy as is doing this thing called paragliding; now to add to that a 13,000 foot volcano, in Guatemala! That is simply, ridiculously amazing!! To cut a long story short... we came, we saw, we conquered! Somehow, we all managed to get off the volcano in one piece without incident. So much could have gone wrong, but didn't! 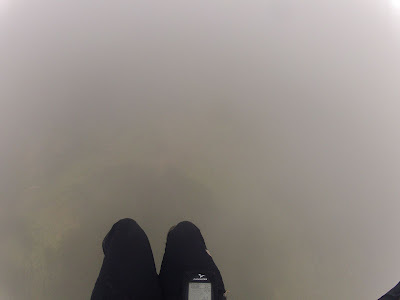 Words simply can't describe the feeling of flying off a 13,000 foot volcano into buttery smooth air, dropping down into the white room, and emerging 5 minutes later as the golf course appears directly below through a hole in the clouds. It was perfection! Unfortunately the days following, the weather didn't play to our best interests and we didn't get any other flying in. But it was an absolutely amazing time exploring Guatemala in the off days, and just relaxing at the Casa... soaking in the sun, drinks, and good company. A huge thanks to Drew, Marc, Lan, and the A-FIN-ITY crew for doing everything they did to make this a fun, successful, and safe trip. The Never Ending Saga of Building The Paratows Winch. The project as you know, started in 2010 when I decided to design and build my own hydraulic winch. After 3 years of work and many modifications it is finally approaching perfection. I also went down to Discover Paragliding in Astoria Oregon in 2012 and earned my Tow Tech rating. In the previous article I had mentioned a problem of the winch dumping all pressure when running at speed. After many tests I finally decided to mount my helmet camera to the winch to figure out what was going on back there. I don't know why this was not thought of before, but the issue presented itself loud and clear. The one way bearing that would drive the hydraulic pump during payout and free spin during rewind was failing. So I made it stronger. I went out with a few friends and did some towing and found that the winch is the smoothest payout any of us have ever felt. It provides amazing consistency and there is no jerking on the line due to line digs or rapid pressure changes. We had finally achieved success. Or so we thought. After about 20 tows the bearing failed again. Time for another redesign. The pump drive system was redesigned and this time I installed a super strong bearing that carried a heavy price tag of $600. The tracking head also left a lot to be desired so that was redesigned and is working great now. I got the crew together once again to go out and prove it's operation. We did 7 tows and finally had no failures. Finally we had success right? Not really. The next time we went out for some towing fun I decided it was time for a torture test. We towed 10 times that day but we did the last 4 tows in rapid succession with no breaks for the winch. Everything worked great except now I had a heat issue. The pressure control valve would get so hot I could barely touch it. It was time for an oil cooler. Since installing the oil cooler I have not had the heat issues anymore and have about anther 50 tows on the winch that have been failure free. As a precaution I have added a fan to the cooler for those hot summer days. After all these modifications there are still a few more I would like to do as the money comes available. These modifications are for operator ease and do not affect the pay out or safety in any way. So as it sits right now, the winch is in full operation for days of flying fun. Now it is time for the towing stories and the rules of towing. During my Tow Tech training I was told over and over again that weird stuff can and will happen and to be ready for anything. Even though strange things do happen at times, I firmly believe that tow launching is safer, faster, and more efficient than foot launching at a traditional site. We have the ability to tow right into the heart of thermal activity with a loaded wing that is highly resistant to collapses. During the launch and initial flight phase we don't have the issues with an unloaded wing that may collapse 10 feet off the ground and cause injury. Entering a thermal on tow has a mild impact on the glider when compared to free flight due to the pitch stability created by the speed assist on the tow bridle and the roll stability of a wing on tow. I will admit that there is a tow tolerance that must be built just like the bump tolerance we have learned. Thermal entry is not scary or dangerous, it is just a little different feeling than we are used to. The wing is pitched back slightly on tow and when you initially hit a thermal it pitches back a little further. The speed assist kicks in and it parks right back in it's slightly pitched back position. When you exit the thermal, instead of getting the surge that puts the wing in front of you, it will move directly overhead then pitch back again to it's speed assisted tow position. I have had great experiences towing. I have also had great experiences being towed by my own winch. We have done light pressure tows, middle, and max pressure tows where I was hitting climb rates of 1,000 feet per minute! We have done thermal tows and simple sled ride tows. On those light lift days it is a great feeling to get towed up to the top of the lift and be able to boat around for an hour or so. (kiowapilot2000 on youtube to see some of the tows) This leads me to the simple rules of towing. Another interesting learning point was with an XC pilot. If you use a flight deck make sure that the clips that attach it to your harness are facing with the opening oriented in and not out. We had a tow where the pilot had the clips oriented out and did a reverse launch. What happened is one side of the tow bridle clipped into the flight deck and the pilot after launching was flying sideways in a hard weight shift to the left. The situation was corrected with an immediate drop in pressure which righted the pilot and allowed a safe landing. The above cases are not the norm. 99% of the tows will be a non event as long as the pilot and tow operator do their part. We have had many great tows with some in excess of 3,000 feet AGL! If it is your first time towing with me it is okay, I tend to error on the side of caution when it comes to people I have not towed before and run the pressure to the pilots comfort level. I have a smooth system and the ability to watch you from your inflation until you pin off at the top of the tow. So come on out and play with Paratows. It will be a great time for all and I promise that the Paratows winch will provide the smoothest payout you have ever felt. Fly high and fly safe.